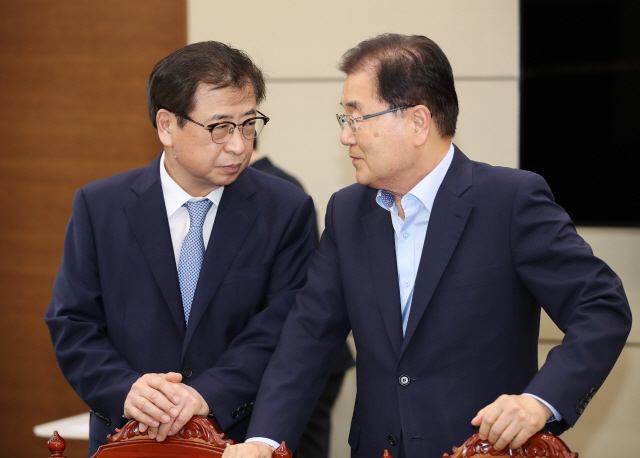 "The special delegation is scheduled to leave (Pyongyang) after attending a dinner," Cheong Wa Dae spokesman Kim Eui-kyeom said, adding it was not clear who would host the dinner. They held their second bilateral summit in Panmunjom on May 26, which was followed by a historic summit between US President Donald Trump and Kim in Singapore on June 12. Denuclearization talks between the US and the North seemed to reach an unprecedented level following the historic US-North Korea summit in June. Many in South Korea and the US believe any development in the South-North Korean relationship followed by increased economic cooperation between the two Koreas may weaken or even remove the North's need or willingness to denuclearize in exchange for security guarantees, as well as economic support from the United States and its allies. Chung said an improvement in inter-Korean relations may even help salvage the stalled denuclearization negotiations between the US and the North.